Andrew Copp scored twice and Connor Hellebuyck set an NHL record for most wins in a season by an American goaltender and the Winnipeg Jets beat the Chicago Blackhawks 4-1 on Saturday. 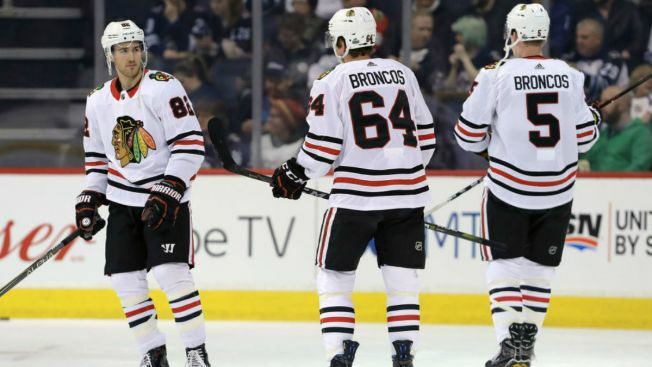 Jets and Blackhawks players also wore the word "BRONCOS" on the back of their game jerseys in place of their own names to honor the victims and survivors of the fatal bus accident Friday involving Saskatchewan's Humboldt Broncos junior hockey team. Hellebuyck, the 24-year-old Commerce, Michigan, goalie made 30 saves to pick up his 44th win (44-11-9), surpassing Tom Barrasso's 1992-93 run with the Pittsburgh Penguins. Dustin Byfuglien and Kyle Connor also scored for the Jets (52-20-1), who have won five straight and a franchise-record nine in a row at Bell MTS Place. Jeff Glass stopped 35 shots for the Blackhawks (33-39-10), who didn't make the playoffs for the first time since 2007-08. Brent Seabrook scored Chicago's goal. Blackhawks forward Patrick Sharp got a standing ovation in the third period after the announcer told the crowd it was the veteran's final game. Sharp is retiring after 14 NHL seasons, 11 with Chicago. Byfuglien began the scoring when he scored 13 seconds into a two-man advantage with a high blast from the point at 15:12 of the first period.